In some operations, this is the default method. Sometimes these loads are floor-stored between bollards and a wall, or other obstructions that prevent them from rolling or falling outside the defined storage area. This method is the baseline, and it’s not pretty. Cost: Floor storage has no direct cost. There is not much if any equipment to purchase. Some installations require bollards or posts, or floor striping for organization. Space Consumption: The floor is going to host exactly one bundle in a given area. It’s not going to stack well, and if it does, that’s a potentially dangerous stack. 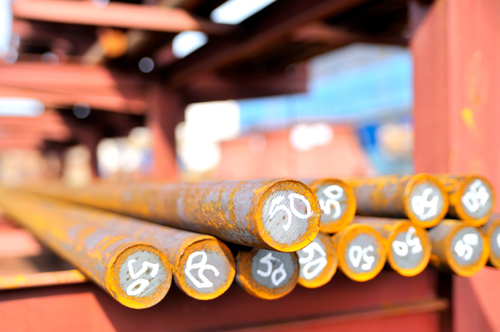 Ease of access: Ever try to pick up a 12′ bar of steel from the floor, or even off a stack? Typically you can use a hoist, but not a forklift. Most of the time, floor loads are hand picked. Safety: An unsecured bundle isn’t safe. But one that sits on the floor isn’t going to fall on anyone, although it might slide out onto legs or feet. For any significant operation, this is going to slow you down, endanger people, and cause inventory damage. It’s acceptable for a very low moving stock that is near to its processing machinery or otherwise in a niche somewhere that isn’t expected to grow. A good majority of these loads are stored on cantilever rack. Drive around any industrial district and you’ll see cantilever racks holding tube & pipe loads everywhere, and for good reason. It works, it’s relatively inexpensive, and it’s durable. Cost: Cantilever rack is cost-effective. It can range from a few hundred dollars to several thousand per rack, depending on the height, capacity, length, etc. Space Consumption: Cantilever racks allow you to place stock (like steel, aluminum, or iron) into racks and off the floor so you can utilize vertical space, but you’ll need space for forklift aisles. Cantilever can utilize more vertical space than anything else you can do, so you’ll be able to take advantage of building height with it. Column capacities get into the tens of thousands of pounds and arm capacities into the thousands. For a single aisle of storage, it is the best option. For multiple rows of storage, the aisles tend to reduce density. Ease of access: Cantilever can be loaded or unloaded with forklifts, stackers, or by hand (if the load is light enough). The static arm positions tend to make hoists or cranes unworkable, since the upper layers obstruct the lower ones. Safety: If properly specified, cantilever racks can reliably hold heavy loads. Workers need to be cautious when handling any large, unwieldy, heavy item whether racked or not. Stacking racks are the most versatile option, but also have severe limitations. Cost: These racks are inexpensive, but you have to buy multiple ones to accommodate greater lengths of stock or tubing. Space Consumption: Stacking racks can provide a fairly dense product storage method. They can be stacked (depending on type) 4-6 layers high. They will require aisles for loaders or forklift access. They do not have the vertical utilization a cantilever system does. Ease of access: You must unload the top layers to get at the load in the middle or on the bottom layers, no matter that method you’re using for loading or unloading. This results in what amounts to extra picks every time you access anything but the top layer. For a product that is all the same in a given rack, that’s not a problem – pick a layer off and go to the next. For mixed stock, it’s a disaster. 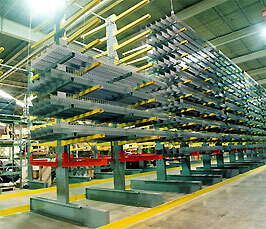 Safety: Stacking racks are stable if specified and stacked correctly. Don’t overfill them or add layers over what the specifications tell you.